Malavika Sarukkai in "Ganga Nitya Vahini (The Eternal River)"
Site Seeing: Rediscover Public Art This Spring! Theatre Confetti presents "Edith Can Shoot Things and Hit Them"
Philagrafikahas commissioned Spanish artists Patricia Gómez Villaescusa and María Jesús González Fernández to create Doing Time | Depth of Surface, an exhibition exploring the architecture and stories of Philadelphia’s historic Holmesburg Prison. Gómez and González have created large-format “printings” of drawings, paintings and graffiti left by former inmates on the walls of the prison, which opened in 1896, operating for nearly a century and being decommissioned in 1995. The exhibition gives a voice to the guards, employees and inmates who lived in the Northeast Philadelphia prison. Doing Time | Depth of Surfacewill run from January 28 – March 17, 2012 at The Galleries at Moore College of Art & Design in Philadelphia. The exhibition explores new trends in contemporary art and printmaking, pushing the boundaries of what constitutes “print.” Philagrafika will also host related public programs, document and expand the project through its website and publish an exhibition catalogue. The exhibition is Philagrafika’s first since the presentation of Philagrafika 2010: The Graphic Unconscious, the citywide, multiple-venue, international festival which redefined contemporary printmaking. With a mission to promote and sustain printmaking as a vital and valued art form, Philagrafika continues to build upon and reinforce the themes of innovation and collaboration that were first explored in the organization’s 2010 festival. The commission of Gómez and González also continues support of international artists in interpreting Philadelphia’s history. The first phase of the project began with an extensive residency, during which the artists conducted research and onsite documentation of the project. 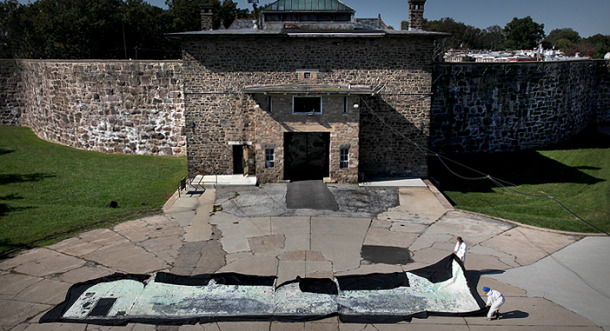 The artists visited Holmesburg Prison where they utilized a unique method of monoprinting to transfer the history of the deteriorating prison’s walls into prints, salvaging the outer surfaces of the prison cells. The exhibition at Moore will feature a surveillance-style video installation along with an audio installation, still photographs from the residency and the resulting monoprints – two full cell size and 150 smaller pieces – which serve as a physical archive of the prison cells and the lives of the prisoner’s who lived in them. Philagrafika, formerly known as the Philadelphia Print Collaborative, was founded in 2000 in recognition of a growing convergence in Philadelphia of artists, educators, curators, non-profit arts organizations, galleries, print workshops and museums that needed a central organizing body for cooperative initiatives. Philagrafika builds upon the Philadelphia region’s rich printmaking history and abundant artistic resources to enhance the city’s presence as an international center for innovative printmaking. In 2010, the organization produced its first quadrennial event, Philagrafika 2010: The Graphic Unconscious, a collaborative, citywide event celebrating print in contemporary art and showcasing internationally acclaimed and locally recognized artists. Philagrafika’s mission is to promote and sustain printmaking as a vital and valued art form by providing artistic, programmatic and administrative leadership for large-scale, cooperative initiatives with broad public exposure. They do this through an international contemporary art festival, an annual invitational portfolio and special projects. Their programs have been designed to present new curatorial and critical models for printmaking – models in which the medium is presented as an integral component of current artistic practice. Download the full press kit by clicking the link to the right. The Exhibition: Doing Time | Depth of Surface, commissioned by Philagrafika, is an exhibition exploring the architecture and stories of Philadelphia’s historic Holmesburg Prison. Spanish artists Patricia Gómez Villaescusa and María Jesús González Fernández have created large-format “printings” of drawings, paintings and graffiti left by former inmates on the walls of the prison, which opened in 1896 and operated for nearly a century before being decommissioned in 1995.